In the tool-option, remove the √ in front of the step ladder stt in the contact format, and then change the program. After the change, convert the save and then hit the √. 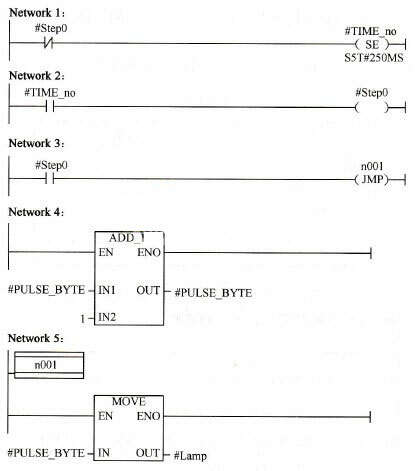 This entry was posted in plc program and tagged mitsubishi plc ladder logic examples, mitsubishi plc programming examples, PLC ladder diagram on January 21, 2019 by arco. Mitsubishi does not have a power-off delay to close the relay. 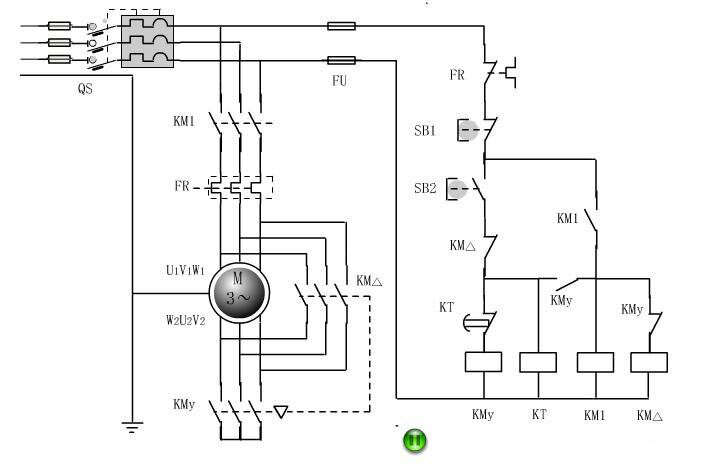 Only the power-on delay closes the relay, but it can be implemented by a program. M0 is set and T0 starts counting. When the contact T0 is output, the function of closing the power-off delay is reached. 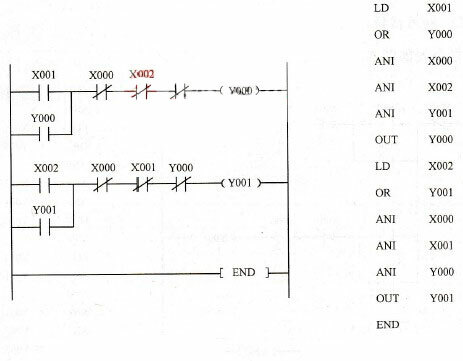 This entry was posted in plc program and tagged gx developer off delay timer, PLC ladder, PLC ladder diagram, plc ladder logic examples on December 12, 2018 by arco. 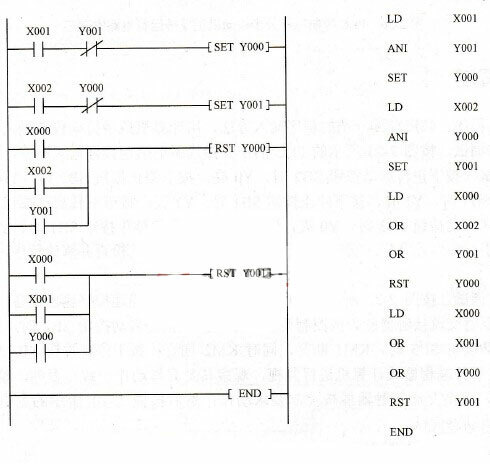 What does ADD mean in Mitsubishi plc programming? This entry was posted in plc program and tagged Mitsubishi PLC, mitsubishi plc basics, PLC ladder diagram on December 4, 2018 by arco. Press X0, M0 is energized and self-locked. 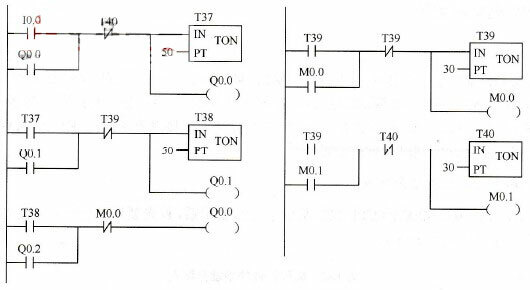 At the same time, KT1 is turned on and Y0 is output. At this time, the motor is rotating 10S. When the 10S time is up, T1 disconnects YO, and M1 is powered on and locked. At the same time Y1 output, the motor is reversed. KT28 seconds to the time, M0 reset, at this time a working cycle is over, automatically enter the next cycle. 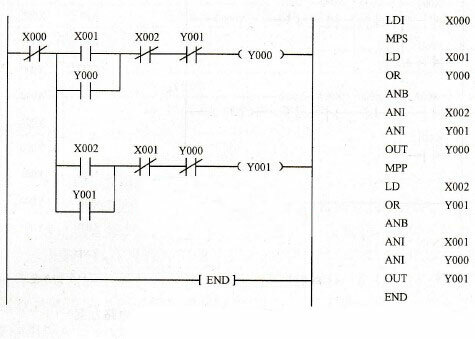 This entry was posted in plc program and tagged Counter Plc ladder Diagram, Mitsubishi PLC, mitsubishi plc basics, PLC ladder diagram on December 4, 2018 by arco. This entry was posted in plc program and tagged Learn PLC programming, PLC ladder, PLC ladder diagram on July 31, 2016 by arco. 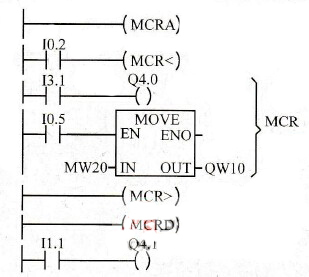 Main control relay (Master Control Relay), abbreviated as MCR. MCR Master relay command is used to control whether normal execution of the instruction in the region, equivalent to a connect and disconnect the “flow“ of the main switch. MCR instruction is not much used, S7-200 is no MCR instruction. MCRA to activate the master relay instructions, MCRD to deactivate the master relays orders. Open the master relays orders “MCR<“ in the MCR before you save the results of logical operations on the stack RLO (MCR), close the master relays orders “MCR>“ MCR saved out of the stack in the RLO. “MCR<“ and “MCR>“ used to indicate controlled temporary “power cord“ formation and termination. MCR instructions can be nested, MCR the MCR can be another zone. MCR stack is a LIFO stack, allowing the maximum nesting depth of 8 levels. MCR–I0.2 control, I0.2 and MCR MCR in the stack level of the same State. MCR bit is 1 when will perform Q4.0 coil MCR control area and MOVE instructions. MCR bit is 0 when Q4.0 is 0. This entry was posted in plc program and tagged Learn PLC programming, PLC ladder diagram, PLC programming on July 30, 2016 by arco. 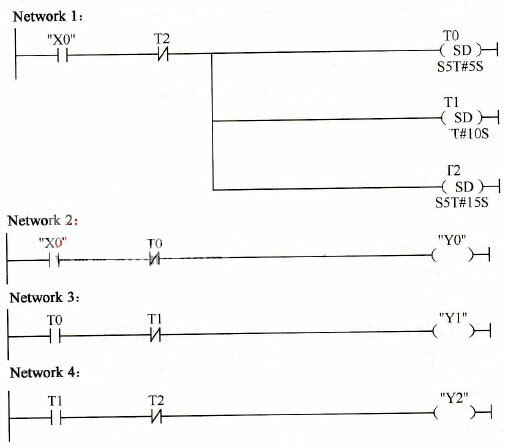 CALL in the ladder diagram coil can call functions (FC) or system functions (SFC), the call cannot be passed parameters. 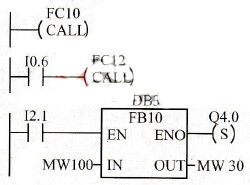 Calls can be unconditional, CALL directly connected to the vertical line on the left side of the coil, equivalent to UC in the statement table orders; can also be conditional, condition provided by the control CALL contact circuits of coils, equivalent to CC in the statement table instructions. Logical block is called if you need to pass parameters, you can use the command to invoke the function block in the box. 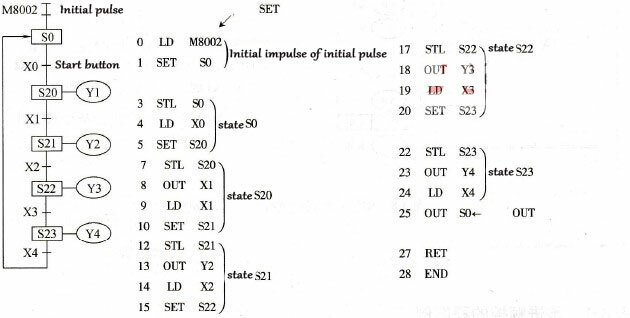 FB 3-70 box in Figure 10 is the function that is being invoked, DB3 is called FB 10 o’clock block of background data. Conditions for return instructions (Return,RET) appears as a coil, left logic for conditional block conditions provided by the contact circuit to control it, RET coil cannot be connected directly on the left of the vertical “power cord“. If you call it is the unconditional return, at the end of the block does not require the use of RET instruction. In machine operation, speed and accuracy are often contradictory, in order to improve machine efficiency and increase speed, parking control there is a problem. So it is necessary to control. As a simple example, motor driven mechanical home by starting location, such as at top speed to return, due to the high speed stop inertia, the deviation in the home has to be large, slow down to ensure the accuracy of positioning. Position control systems, often adopt servo motor and stepping motor driven device. Open–loop control and closed–loop control can be used. For stepper motors, we can adjust the send speed to change the machine‘s working speed of the pulse. With the FX series PLC, navigate through the pulse output of the unit or module, you can achieve the position of one or more points. FX2N series are described below–pulse output module and the control module. (1) pulse output module FX2N-1PG. FX2N-1PG pulse generator unit can complete a separate axis of orientation, this is achieved through servo or stepper motor drive amplifier provides a specified number of pulses to achieve. FX2N-1PG is only used for FX2N series, with TO/FROM instruction set various parameters, and speed read out position value. The modules take up to 8 I/O point. Output up to 100kHz the pulse train. (2) the controller FX2N-10GM. FX2N-10GM for pulse output unit, whether it is a single–axis positioning unit, not only can handle single-speed, and interrupts location, and can handle complicated control, multi-speed operation. FX2N-10GM can have up to 8 connections on the FX2N series PLC. Maximum output is 200kHz. (3) positioning controller FX2N-20GM. A FX2N-20GM controlled two–axis, performs linear interpolation, circular interpolation or independent two–axis positioning control. Maximum output pulse trains of up to 200kHz (interpolation period, a maximum of 100kHz). (4) the programmable cam switch FX2N-1RM-E-SET. In the mechanical drive control, often to diagonal position detection, different at different position in terms of conduction, shutdown signal. Used mechanical cam switches, mechanical cam switches and high precision, but easy to wear. FX2N-1RM-E-SET programmable cam switches can be used to replace mechanical cam switches for high precision angle position detection. Complementary angle sensor cable length of up to 100m. Application and other programmable cam switches, brushless resolver high accuracy angle setting and monitoring its internal EEP-ROM, no batteries, can hold up to 8 different programs. FX2N-1RM-E-SET on the FX2N, can also be used independently. FX2N maximum 3. It takes 8 I/O point. 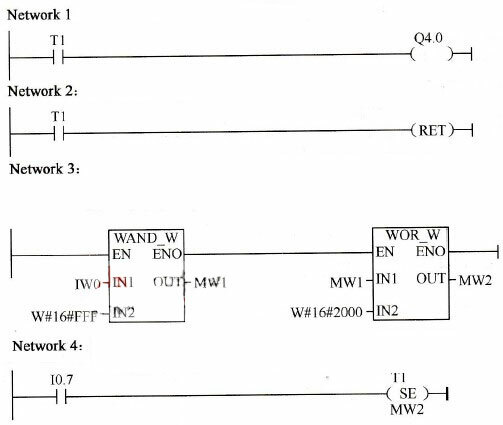 This entry was posted in plc program and tagged Learn PLC programming, PLC ladder diagram, PLC programming on July 29, 2016 by arco. PLC communication module is used to complete with other PLC intelligent control, other communication between devices or computers. Following brief introduction to FX serial communication function expansion board, adapter and communication modules. (1) communication expansion board FX2N-232-BD. FX2N-232-BD is to connect standard PLC and other RS-232C transport device interface board, such as personal computers, bar code reader, or printer. The panels can be installed inside the FX2N extension. The maximum transmission distance is 15m, the maximum baud rate for 19200bit/s. PLC using special software for the extension plate can be running monitoring, can also be transmitted from the PC to the PLC program. (2) communication interface module FX2N-2321F. FX2N-2321F on connect FX2N series PLC can realize RS-232C with the other full–duplex serial communications interface devices, such as personal computers, printers, bar-code reading device and so on. FX2N series FX2N-2321F modules can connect up to 8 blocks. The module using FROM/TO command to send and receive data. Maximum transmission distance is 15m, the maximum baud rate for 19200bit/s. The modules take up to 8 I/O point. Data length and serial communication baud rate can be set by a special data register. (3) communication expansion board FX2N-485-BD. FX2N-485-BD for RS-485 communication. It can be applied to no agreement on data transfer, FX2N-485-BD at the time of the original agreement, as a way, using RS instruction in personal computers, barcode reader, printer, data transfer between. Transmitting maximum transmission distance is 50m, the maximum baud rate for 19200bit/s. Each of the FX2N series PLC expansion boards can be fitted with a FX2N-485-BD communication. In addition to using this communication expansion boards and computer communications, it can also be used to achieve two parallel between FX2N series PLC. (4) communication expansion board FX2N-422-BD. FX2N-422-BD to RS-422 communications, can be connected on the FX2N series PLC, and as a tool for programming or control a port. This interface is available outside of the PLC connected to PLC devices, data storage unit, and human-machine interface. FX2N-422-BD can be used to connect two data storage unit (DU) or DU–series unit and a programming tool, but one can only connect a programming tool. Every basic unit can be connected to a FX2N-422-BD and cannot be used with FX2N-485-BD or FX2N-232-BD. Use MSLSECNET/MINI interface module, series PLC of FX series PLC can be used as a local control station, constitute a distributed control system. Above on the FX–series only gives a brief introduction to the communication module, specific application again in detail in later chapters. This entry was posted in plc program and tagged Learn PLC programming, PLC ladder, PLC ladder diagram, PLC programming on July 29, 2016 by arco. When the X0 on, the lamp Y0 on ; after 5S, the lamp Y0 off, the lamp Y1 on ; after 5S, the lamp Y1 off, the lamp Y2 on, and then after 5s , the Y2off, the lamp Y0 on, cycle…. This entry was posted in plc program and tagged Learn PLC programming, plc basics, PLC ladder, PLC ladder diagram on July 23, 2016 by arco. In the programming use CPU memory clock,Setting MB100 clock memory, the M100.0 change cycle is 0.1s.Enter the symbol for the address I0.1, I0.1 positive edge down counter C0 to set the number, if I0.0 is 1, C0 minus 1 per 0.1s. 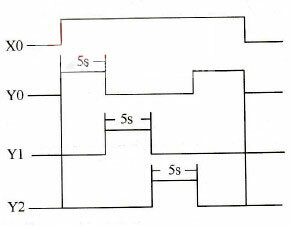 Output symbol address Q0.0. If the I0.1 is the number of positive hops down the counter C0, if I0.0 is 1, then C0 per 0.1s minus 1. When the C0 is reduced to 0, the output Q0.0 is 1. I0.1 and a positive jump along the C0 set number and make the output to 0. Thus, after the I0.0 is 1, 2S (20 x 0.1s=2s), Q0.0 is 1, and the positive I0.1 of is reset to the Q0.0. This entry was posted in plc program and tagged Learn PLC programming, plc basics, PLC ladder diagram on July 21, 2016 by arco. 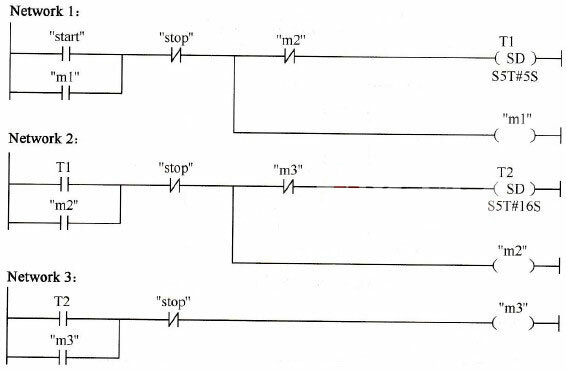 Initial state is originally from the STOP PLC to RUN switching instantaneous action of the special auxiliary relay M8002 driver, so that the S0 set “1””. In addition to the initial state of the state components must be in other states after the addition of STL instructions to drive, can not be separated from the state and other ways to drive. This entry was posted in plc program and tagged Learn PLC programming, plc basics, PLC ladder diagram on July 18, 2016 by arco. KM1 for the motor to run the AC contactor,KM2 for the motor reverse running AC contactor,SB2 is the positive turn button,SB3 to reverse the start button,SB1 for stop button,FR for thermal protection relay. When the SB2 is pressed,KM1 coils pull,KM1 main contact closure,The motor begins to run forward,At the same time the KM1 auxiliary normally open contacts and the KM1 coil power pull,The positive continuous operation of the motor is realized,Press the stop button until SB1;On the contrary, when the SB3 is pressed,KM2 coils pull,KM2 main contact closure,The motor begins to run in reverse,At the same time the KM2 auxiliary normally open contacts and the KM2 coil attracting, the motor reverse continuous operation,Press the stop button until SB1;KM1, KM2 coil interlock to ensure that the power is not at the same time,The research of this task uses PLC to realize the positive and reverse PLC control of the three-phase asynchronous motor. 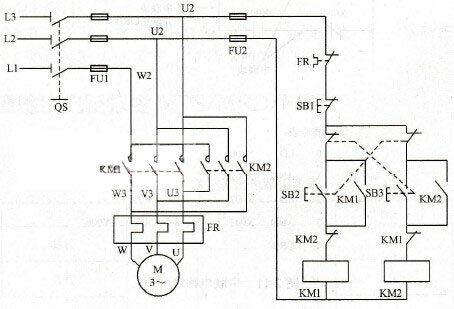 The external hardware output circuit using KM2, KM1 normally closed contacts to the mutual lock.